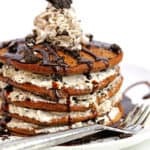 The most sensational Oreo Pancakes Recipe (or Cookies and Cream Pancakes) you have ever witnessed... or tasted! In a large bowl, add flour, baking powder, sugar and cocoa powder and whisk together until well mixed. Next add in eggs, milk, melted butter, vanilla extract and chopped Oreos and whisk until batter just comes together and leave the lumps there. No need for a smooth batter. Heat a griddle or non stick skillet over medium heat and melt extra butter. Pour about 1/4 of a cup of batter onto the griddle surface in a circular pattern. Allow each pancake to sit until bubbles form and the bottom is browned and crisp. Flip over the pancake and cook until browned and crisp on the other side. Remove the pancake and place in a warm oven (about 225 degrees) and repeat the process until all pancakes are done. Add heavy cream to your mixer bowl and mix on high speed. When peaks begin to appear, add in sugar and cornstarch and continue mixing. Once stiff peaks begin to form, add in Oreos and turn off. Add one pancake to serving plate then top with whipped cream, then add another pancake and top with whipped cream. Do this for as many pancakes as you would like then add chocolate sauce over the stack of pancakes and finish with whipped cream on the top pancake with chopped cookies and cream for garnish.